The Political Student | Make It Appn: The Case for Digital Democracy. In the wake of the political scandals that shook our Assembly to its core, the people of New York have an appetite for real political change. For too long, they have been complacent with the status quo while politicians, like Sheldon Silver, exerted their monopoly over the state system at the expense of hard working New Yorkers. For years, the power of charm and charisma have led to disastrous complacency and systemic abuses. Veteran politicians, like Silver, exuded a charm and familiarity that bred the complacency. The complacency turned into apathy, as people sought solace in the familiar, and that turned into a web of lies and corruption. Thanks to the scandal, the people of New York have awoken from their decades-long hibernation with an insatiable appetite for political change, and transparency that can no longer be filled with empty promises and leaps of faith. In the 65th Assembly District, alone — which is, perhaps, the District most affected by Speaker Silver’s conviction — there have been 3 elections to fill the disgraced Speaker’s void. The first election — on April 19th — saw three wide-eyed politicians seeking to fill the final months of the Speaker’s Assembly term in the state-mandated emergency election. The second election on September 13th saw six politicians vie for the Democratic nomination. The third and final election will determine the new Assemblyman for the District. The 65th Assembly District — which is home to Lower Manhattan, including Tribeca, Chinatown, Lower East Side, and Little Italy — is shaken and broken, and many seek to fill the political void left by the disgraced democrat. The public, however, is not buying the empty promises, which is why all recent public events and campaigns have centered around the issue of transparency. The events, which are relatively well-attended, have seen many constituents demanding more from their politicians as the first step in statewide reparation. The consensus seems to be that government should be more transparent, and politicians should be accountable to the people they represent — the only question on everyone’s minds is how that will be facilitated. I am proposing that the best way to restore public trust and repair the institutions is through complete system digitization, which would empower every citizen to play a bigger role in global politics. 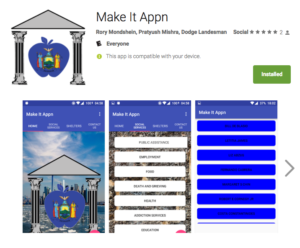 I, for one, used the political void as an opportunity to get more involved and develop a mobile application to promote greater government transparency with the help of local politician, Dodge Landesman, who shares my insatiable appetite for political reform. 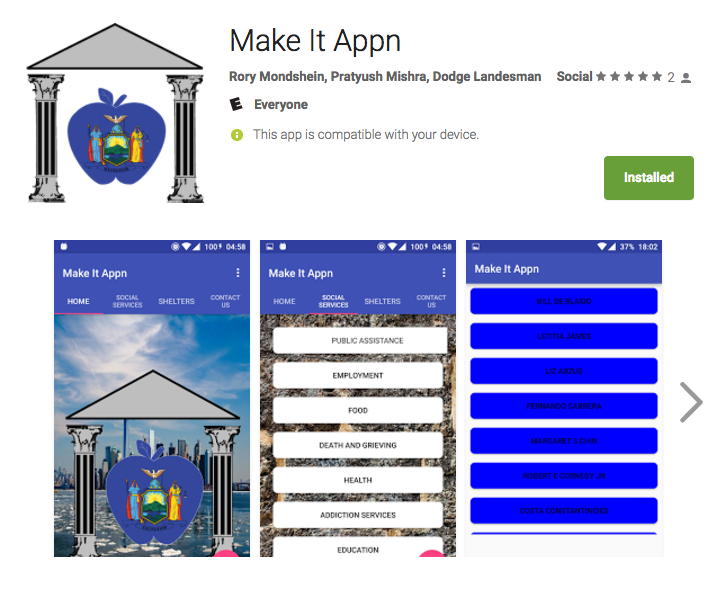 The app — called “Make It Appn” — has many different functions, and: (1) centralizes social services, (2) allows New Yorkers to book homeless shelters for those in need, and (3) promotes greater government transparency through direct contact with politicians. The app includes pertinent information about social services — including but not limited to public assistance, healthcare, legal services, educational opportunities, job training, death and bereavement services, and voter information — and allows users to interact with their politicians directly by syncing with Facebook and Twitter. In addition to promoting greater government transparency, the key feature of the app is that it allows everyday citizens to take a more active role in combatting homelessness by enabling them to book a homeless shelter for someone in need. The app, which is available on Android and iOS devices, gives users the option to filter their results based on the type of shelter, see a map, and then reports the shelter’s availability. Former State Committee candidate, Dodge Landesman, wants to use the results to determine the number of beds needed, and give tax breaks to any mattress company that wants to help make up for the shortage. The app currently has a Citywide usage. As a result of its generality and functionality, the app has many practical applications that warrant its institutionalization, which are outlined below. Firstly, it centralizes information so citizens know about the different opportunities afforded to them. It empowers them to take a more active role in building the society that they want to live in, and putting the information in one place makes the information more accessible, which means that more people will utilize the many social services available. Secondly, “Booking A Shelter” online will give us a better idea of the demand for these services, and help us adjust our budget to meet the need. It will take the homeless of the streets, and let them know that they are not forgotten. It will change the face and remove the stigma around homelessness by encouraging others to reach out to those in need, as opposed to simply marginalizing them. It will revolutionize the currently flawed system that requires homeless people to spend their work days waiting on infinite lines instead of seeking employment, which will have strong economic benefits. The idea of empowering citizens to make a difference will have numerous social benefits, and contribute to the diffusion of ideas that are central to any vibrant economy — which makes the app both altruistic and efficient. Finally, centralizing political information — including politicians’ contact information and roles — will help constituents direct their complaints to the appropriate agent. By supplementing the contact information with brief descriptions of political roles, we give New Yorkers a window into understanding the dynamics of City politics — something that has often precluded political participation by appearing esoteric. The centralization of information will make politics more accessible, and, by extension, more accountable to every citizen — not just the ones that understand politics. Given these reasons and the flawless execution of the app, it would appear that its institutionalization as an official New York City application should be a no-brainer — but, unfortunately, that is not the case. The key hiccup we have faced is that shelters have not gotten on board to provide the information because there is no means of unifying them. The app would subject them to more state oversight, which they may not want. The digitization of the information would require shelters to consistently maintain their books, as the app would enable any state official and citizen to easily access their information. This would, of course, come at a social cost, and the complete overhaul of the system through digitization would also come at an economic cost. Given the social and initial economic costs, many may be reluctant to institutionalize the app — but we want to show them that digital democracy is the necessary solution to our insatiable appetite for transparency. For these reasons, we are reaching out to civil society — the heart of our democracy — and request that they reach out to their politicians. We hope that others demand discussing the institutionalization of a social services application for New York City to make politics and services more accessible. We have a lot of different issues to deal with, but we cannot begin to tackle them without a greater push for government transparency, and facilitation of people politics. We can’t have politics for the people without the people getting involved, and, greater involvement begins with knowing your rights. We built an app to empower the citizens that are at the heart of our democracy — now, we want YOU to use these tools to advocate for yourselves, and for a long-term solution for change.